A five-star display from United Counties League title contenders Anstey Nomads proved too hot for Holwell Sports to handle on Saturday. Holwell came into the match with back-to-back wins to their name and a good crowd witnessed a close-fought first half at Welby Road with the hosts matching up and working well as a unit against second-placed Anstey. The midfield partnership of Luke Peberdy and Mike Hendey were again looking a good pair, albeit in a more defensive capacity than the previous week’s win at Rushden. Tom Harris and Matt Hendey also put in a real shift in the wider areas to help stifle the threat of Anstey’s dangerous wingers Chitiza and Matwasa as Holwell looked to catch Anstey on the counter. A strong run by Dunlop past three defenders ended with a good block tackle by Preston, and at the other end Anstey were finding Bitmead, Stevenson, Clark and Dunlop a tough nut to crack. And a superb save by Cragg, tipping Gough’s free-kick around the post, kept the scores level. 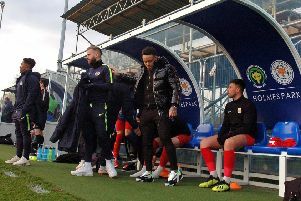 Ambrose was again doing sterling work to link up with Holwell’s midfield, but Anstey remained patient with their approach work as they searched for the opener. The visitors had a loud appeal for a penalty turned down as half-time loomed, but just as Holwell looked to be going into the break on level terms, Anstey found the breakthrough. Hicks cut inside and curled his shot low in the corner. The second half began in similar fashion with Anstey having the lion’s share of possession, but with Holwell doing a good job of containing the threat. Until on the hour, Mark Hicks was on hand to calmly finish a low cross to double the lead. The final 20 minutes saw Nomads show their attacking flair as they punished weak, shoddy defending. Hicks completed his hat-trick from the penalty spot and added his fourth, while Gough slotted another spot-kick to round off the scoring at 5-0. General manager Steve Hendey said: “I thought Anstey were the best all-round team we’ve faced so far and I was very impressed with their patience in the final third. “We were very disciplined and compact for 70 minutes, but unfortunately the tactical change made backfired and we looked leggy and lost our shape. Holwell stay 15th and head to third-bottom Thrapston who shipped six at home to leaders Lutterworth on Saturday to extend their winless league run to 16 matches. Holwell: Challis, Dunlop, Stevenson, Clark, Bitmead, Mike Hendey, Peberdy, Matt Hendey, Harris, Ambrose, Gaskin, Lane.